We were not ready for an expedition of this magnitude. We had no gear, no food; in fact we didn’t have anything it takes to climb to the top. Fortunately we found a shop in the small village of Anandapaur in the valley below Everest. The shop keeper supplied us with all the necessities, tents, lanterns, snowshoes, all for a reasonable price, of course. He informed us we could take the old “Tea Train” from Anandapur to the mountain. It seems that two entrepreneurs opened up the track to transport tourists there - only one problem; the local legend. It seems that the villagers believe in the great and powerful creature, the Yeti. The yeti guards the mountain and protects the line between man and nature, and we may be crossing that line if we go. Do we believe in this mythological creature - I think not! There is no proof. Well, a visit to the Yeti museum would change my mind. A vast number of carvings and sculptures of the great beast only prove that the people here strongly believe in the creature. On display here in the museum are remnants of the torn apart campsite found halfway up the mountain, some blurry photos of the monster taken quickly as he approached and...Wait… a giant cast of the creatures footprint found in the snow? Maybe there could be some truth in this after all. Never the less we press on. We board the train. The small steam engine has seen better days. A short whistle signals us there is no turning back now. It’s a sunny day as we approach the mountain. Primitive carvings and paintings of the beast give us a final warning to turn back. Up we go. We are at the mountain now turning upwards toward the peak. We turn a corner and suddenly we see up ahead the tracks have been ripped apart into a mangle mess. Brakes, brakes where are the brakes. A hawk appear, its screech is calling for us to turn back -we do but not by choice! The train starts to roll backwards, spiraling down into the dark recesses of the mountain. As we near the bottom the train stops…wait…. A shadow…it can’t be… it’s him it’s the Yeti! He’s tearing up more tracks. Looks like he’s above us. The train is moving again. Thank goodness its forward. Holding on we go faster and faster …threes no stopping now #Were almost there! We were the one that didn’t belong there. Why didn’t the Yeti grab us and eat us alive? We had to buy T-shirts. 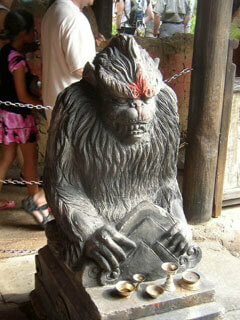 Disney’s Expedition Everest opened in May 2006. I heard that people we saying good things about the new attraction and its effects. My nine year old son Tyler was a little apprehensive about it (he doesn’t like big drops yet). 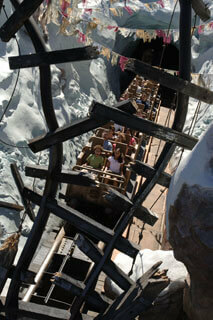 I had heard it was like Big Thunder Mountain - only a little faster and the turns were more “banked”. When we got there, that was what everyone else was saying too. So, Tyler agreed to try it. He rode it three times! The ride boasts a speed of up to 50 mph, an overall height of just less than 200 feet (Florida’s highest peak) and an 80 foot drop. The Audio-Animatronic Yeti is Disney’s most technologically advanced creature to date, and moves with a force equal to that of a jumbo jet. 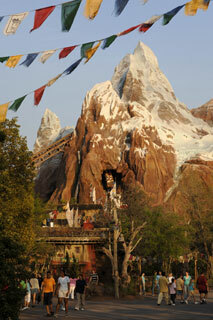 But perhaps even more impressive, is Disney’s rendition of the fictional Himalayan village of Serka Zong. The architecture is based on Tibetan and Nepalese designs, and each building is detailed to look 50 to 300 years old. Approximately 120 species of Himalayan greenery, including 900 bamboo plants, were imported to re-create the lowlands surrounding Mount Everest. Upwards of 2,000 handcrafted Asian artifacts were used throughout the “village”, lending an authentic air, and the sculptures and artwork in the yeti museum are based on originals of the same. A perilous journey aboard a runaway train through the Himalayan mountains. Adventurous riders push deep into the lair of the feared yeti, guardian of the forbidden mountain. En route, they encounter torn tracks, spiral backwards through the fog into an ice cavern and dart into and out of the mountain in a high-speed adventure. Mountain peak: At just under 200 feet, the tallest of 18 mountains created by Disney Imagineers at Disney parks worldwide. 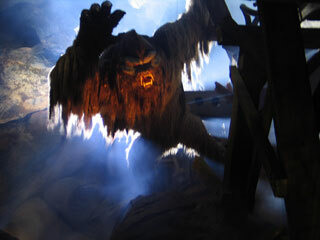 Chilling thrills: A careening adventure including an 80-foot drop, plus frightening encounters with the mystical yeti. Length: Nearly a mile of track as riders encounter harrowing twists, tight turns and drops. Ride vehicle: Modeled after an aging, steam-engine tea train; 34 passengers per train. Yeti, Guardian of the Mountain: The mammoth-sized Audio-Animatronics yeti has a potential thrust, in all of its hydraulic cylinders combined, of slightly over 259,000 pounds force -- potentially more instantaneous power than a 747-400 airliner. Forced perspective: To create the sense of an enormous mountain range, Imagineers painted a "mural" of shadows across the face of the mountains. The range with its glaciers and valleys is a canvas of rockwork, carvings and painting creating a forced perspective where closer-in objects have a massive look while appliqués trick the eye into perceiving far off objects. Bringing the Himalayan environment to Florida: More than 900 bamboo plants, 10 species of trees and 110 species of shrubs were planted to re-create the lowlands surrounding Mount Everest. Steelwork: 1,800 tons of steel were used in the mountain structure. That is about six times the amount of steel used in a traditional office building of this size. Mountain make-up: The mountain is crafted with more than 3,000 pre-fabricated "chips" created from 25,000 individual computer-molded pieces of steel. Color palette: 2,000 gallons of stain and paint were used on the rockwork and throughout the village. The color scheme has ritual meaning to the Himalayan culture. In the Himalayan regions, villagers commonly preserve yak dung and dry it out on village walls. They later use the hardened material as fuel in their homes. 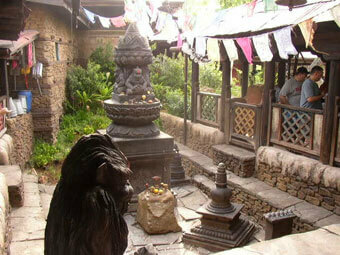 Disney Imagineers recreated the look of these walls in the Serka Zong village area. Artisans at work: Artists from Imagineering used hammers, chainsaws and blowtorches to "age" wood and buildings in the village, giving them the appearance of being longstanding parts of the landscape. Hillary step: The famous final ascent of Sir Edmund Hillary in 1953 is represented in Disney's man-made mountain. The coloring of Mount Everest differs from the rest of the mountain range because at more than 29,000 feet elevation, hurricane-force winds often blow the snow off its peak, revealing a raw sheet of rock. Authentic detail: Some 2,000 handcrafted items from Asia are evident in the props, cabinetry and architectural ornamentation. Height restriction for ride: 44 inches. Seating: 17 rows of two-abreast seating . Disney's FASTPASS: Expedition Everest features Disney's FASTPASS, the innovative system which allows guests, at no additional charge, to avoid lengthy waiting in line.